Even skinny hipsters need comfort food after their model girlfriends leave them for another moody musician. Thankfully, Mama’s Food Shop has been cooking up soul food (and possibly mending broken hearts) in the East Village since 1995. When we think “comfort food” we usually imagine a heavy dinner on a cold, rainy night. But, how about comfort food for brunch? 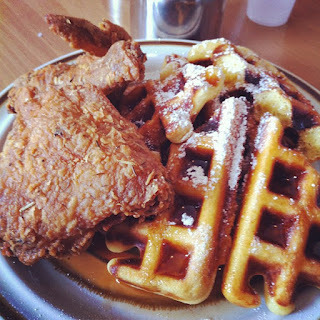 Mama’s Fried Chicken and Waffles will erase your hangover pangs. Three pieces of crispy chicken paired with waffles smothered in cayenne honey butter make for a savory and sweet indulgence. You’ll literally be licking your fingers and sucking on the bones, to the embarrassment of your dining companion. The Biscuits and Gravy, served with a potato hash, are garlicky without being overwhelmingly so. Fluffy biscuits are smothered in white gravy, leaving no need to use more than your fork to dig in. Addicted to caffeine? Start your early afternoon right on the weekends at Mama’s as they’re proudly serving Intelligentsia Coffee. If you’re stopping by for dinner, like most East Village neighbors, don’t miss Mama’s Bacon Wrapped Meatloaf with a heaping scoop of Macaroni and Cheese to forget your unrequited love or just to plain ole’ cheat on your diet. Mama’s Food Shop. 200 East 3rd Street.